In the final home game of the regular season, the No. 9 Boston University men’s hockey team kept afloat in Hockey East play, holding off the University of New Hampshire for a 3-2 win on Saturday at Agganis Arena. The victory, which came after a 3-3 tie on Friday up in Durham, pushed BU (18-9-5, 11-5-4 Hockey East) into a tie for fourth place with the No. 11 University of Massachusetts Lowell. Both teams have two games remaining next weekend. On a night in which they were recognized in a pregame Senior Night ceremony, those same seniors took charge of the offense. Judy has more about the ceremony and the seniors’ contributions in her sidebar. UNH (10-16-6, 4-10-6 Hockey East) boasts two of the biggest scoring threats in the nation — forwards Andrew Poturalski and Tyler Kelleher. Poturalski ranks second in the country with 48 points this season, while Kelleher isn’t far behind, sitting at sixth with 42 points. BU managed to hold the talented duo to just one point this weekend: an assist to Poturalski during Friday’s game. 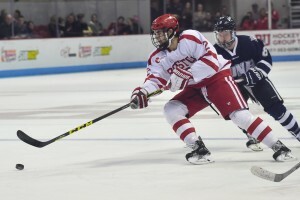 Plenty of BU fans have been on the #FreeSwitzer bandwagon for quite some time now, and, at least myself included, we’ve been behind freshman defenseman Shane Switzer getting more playing time this season. With sophomore defenseman Brandon Hickey going down with injury Friday night, the coaching staff opted to play Switzer on defense for Saturday’s game. Quinn noted that Switzer has “earned the opportunity to play” — and he certainly showed how much he’s earned that opportunity. In his first game in more than two months — his last appearance was on Dec. 12 against then-No. 2 Quinnipiac University — Switzer made an immediate impact in both zones, recording his first collegiate point on a smart pass to senior assistant captain Danny O’Regan to help BU go up 2-0 in the first period. Switzer also found himself back on a 2-on-1, on which sophomore goaltender Connor LaCouvee made what was advertised at Agganis Arena the “save of the game” – but LaCouvee gave all of the credit to Switzer. Overall, Switzer was adequately physical and smart with the puck. He even earned some time on the power play. He wasn’t flawless — UNH forward Tyler Kelleher took advantage of a mishandle by Switzer which led to a breakaway and nearly a goal early in the game — but given that it was only his sixth appearance of the year and his first since December, it’s probably fair to say some rust came into play. But he more than made up for it with his play over the course of the game, and made a strong case to remain in the lineup going forward. While LaCouvee is determined to be ready to play at a moment’s notice, he admitted after Saturday’s game it wasn’t easy at first. But LaCouvee came in this weekend and kept BU in the game, making 19 saves in each game. On a similar note, we do love any chance we get to talk to LaCouvee at a presser — he really brings a great, as he would say, “atmo” to the room, and we can always count on him for a good laugh. Quinn admitted that during the third period, the team had the improper approach. He said that he told the team to be more defense-focused, which may have turned out to be a mistake. Hard to be too picky since the team did get two power-play goals, but Quinn expressed some unhappiness with the team’s performance on the power play in terms of the number of shorthanded chances the team gave up. We didn’t see exactly when he got benched, but sophomore defenseman Brandon Fortunato didn’t play a good deal of the third period from what we saw. He wasn’t particularly sharp all night — we were initially skeptical about him pairing with fellow sophomore Brien Diffley, but Diffley emerged as the better, stronger player on the evening. Fortunato was irresponsible with the puck in his own zone, and had trouble managing the gap. We didn’t see what the final straw was that had him sitting the rest of the game. But since he’s not the most physical of players, he has to rely more heavily on skill and offense to stand out — which has been quite lacking the past several games. Though he had an assist Saturday, that’s just one of two points in his past nine games. Particularly with the coaches seeming to have Switzer in the mix, too, this is not a good time for Fortunato to lack any sort of production if he expects to stay in the lineup. If he’s not bringing a refined game on a consistent basis, there are many more viable options on the blue line. Danny O’Regan has been an amazingly consistent and prolific goal scorer in his BU career. I think he is saving his absolute best performance for March and April. As for Bobo, I loved how he roofed that backhander past Tirone. With regard to next weekend, I can’t believe that we are actually going to have to root for you-know-who to win against Lowell. What a quandary! This is a little off point, but it appears that we lost recruit Vasili Kolias to Union College. I have not found much on the internet on that. Anyone have any information regarding his move. I can only assume it’s because of a major lack of vacancy on our blue line for 2016-2017. From what I have heard, Kolias is very offensively gifted; however I have also heard that he might be a bit lacking on the defensive side of the game. If that is true, we need the opposite. We will have a ton of offense coming from our D corps next season. We need a few stay-at-home guys … who will be physical in front of our net. Confirmed that Vas Kolias has committed to Union next season. It’s definitely a loss. Any info in why Kolias decided to leave BU for Union? I appreciate Glenn Staub’s assumption, but that is only an assumption and I didn’t see a past history which would mark Kolias as a particularly high scoring defenseman.